According to the Japanese, it was believed that chrysanthemum is a symbol of the sun - and the way in which this flower opens its petals denotes perfection. You can mix them with other flowers to add more effect or you can have them on there own. Either way, they will stand out because of its simplicity and beauty! 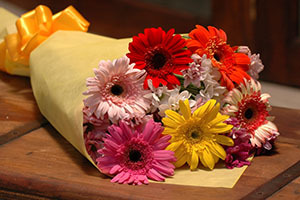 Chrysanthemum flowers often symbolizes loyalty and friendship, so give it to the people that you really care about. Please take note that colors of the Chrysanthemums may vary depending on availablity.